Can you succeed in self-publishing books and ebooks? Yes, of course, you can, and many published authors and writers are achieving success by taking control of their work and becoming author-publishers. While some indie authors work full-time, others use self-publishing as a part-time pursuit and are satisfied keeping their work as a side income. As with any occupation, the adage that the harder you work, the luckier you get, applies aptly to self-publishing. As long as you provide a quality product to the market, you can expect to sell copies of your print books or digital books. But, be realistic. Ebook and book publishing is a competitive and volatile market, so be prepared for some ups and downs along the way. Apart from money, though, there are other reasons that attract many authors to self-publishing. Here are some that you may not have considered. There is no excuse to keep it all to yourself. You’ve written the manuscript and left it sitting in a bottom drawer for years or have it hidden away on a computer backup disk. Get it on Kindle or iBooks and let your story have a chance to be read. Even if only one solitary reader reads it, your story will have at last been given life. Rejection letters from literary agents will be a thing of the past as soon as you self-publish. As will all those bouts of depression and shedding of tears that your postman had to endure from you, any time he had to dutifully deliver the bad news. Self-publish, and don’t forget to give the postman a signed copy. You have had little interest from traditional publishers in publishing your work because it doesn’t fit into a standard genre. Self-publish and perhaps you will discover that there are people out there who share your point of view, or interest, and really want to read about breeding and house training snakes. You never know unless you try. Fulfil your dream by self-publishing one print-on-demand copy of your book and then have it sit proudly on your bookshelf, right alongside, or in between your favourite books. This is a very cheap, simple and highly effective way of impressing your friends and family, and maybe even your boss when you invite him or her to dinner. Letting your feelings free through writing is absolutely normal and has been the starting point for more writers than you can imagine. It is cathartic for sure, but a story that is written with genuine passion has a far better chance of being read and a publishing success than a how-to book on bee farming. You never know, so why not try and see what happens? The bonus is of course that by self-publishing, you have cleansed your soul – and can earnestly hope that the person who caused your grief will get to read it. You have an interesting theory; especially a great conspiracy theory and you have told everyone you know. So why not let more people in on the truth of the matter? I for one adore a great conspiracy theory and still idolise Erik von Daniken. Share your knowledge on any topic that you consider yourself to be an expert. It doesn’t matter what your special knowledge is about, there will always be at least a few people who share your interest and passion – from aardvark grooming through to zymurgy, which is one of my favourite subjects. To save you heading off to your dictionary, zymurgy means the study or practice of fermentation in brewing, winemaking, or distilling. You can use a pen name if you are a tiny bit shy about what you have written. Self-publishing has made naughty quite okay now, and popular in fact, so why keep those fifty juicy little secrets all to yourself? Write a book! Increase your employment chances by having a self-published title or two listed as personal achievements. This will surely impress prospective employers when they see a section of your CV titled Publications. If you took the advice from my previous idea of using a pen name to publish naughty stories, perhaps think about writing on a slightly more suitable topic for inclusion in your CV. Economics or woodwork might be better. Because the keys have been taken from publishing companies, who were the lock keepers, everyone today has the ability, means and freedom to express themselves in writing. Everyone should have the right to say what he or she thinks, and now you can write and be read with that same freedom. If you are new to self-publishing, here are your starting points to learn how to self-publish a book. For those who are new to self-publishing, there are two options available to you if you are self-publishing for the first time. One, pay publishing services a lot of money to do it for you, or two, do it yourself for free. The second option for most authors will be far more attractive, of course. If you are considering paying someone, though, just remember that the tools and services they will use will be exactly the same as the ones you will use if you do it on your own. So consider very carefully before paying hundreds or thousands of dollars for something you can easily do yourself. So where do you start when self-publishing for the first time? After writing your book, and then all the editing and proofreading you have done during the process of preparing your manuscript, it’s now time to drop your pen or leave your keyboard. Now start doing a few days of reading, research and learning about self-publishing and getting your book available for sale. There are three principal self-publishing services that provide their services for free, and these will ensure that once your book and digital book are published, they will be available worldwide via most of the major online book retailers. Amazon Kindle Direct Publishing (KDP). Amazon’s ebook publishing service for Kindle ebooks and now also for paperbacks. As far as book sales go, Amazon KDP is the undisputed market leader in the publishing industry. Smashwords. A publisher and distributor of ebooks to Apple, Barnes and Noble, Kobo and Scribd amongst others. Draft2Digital (D2D). Similar to Smashwords, Draft2Digital is an ebook distributor to Apple, Barnes and Noble, Kobo and Scribd. However, D2D can also publish in print book through Createspace. There is a review of Draft2Digital available here. All of these service providers have well-written Help sections that are a must read, but in particular, a free ebook, the Smashwords Style Guide, is now almost a bible on how to prepare a Word file for ebook self-publishing, so it is an absolute must to read for those totally new to electronic publishing. For Kindle Direct Publishing, Smashwords and Draft2Digital, the advice and preparation steps in this Style Guide will make sure your file is ready for all ebook publishing platforms including Amazon’s Kindle. Should you wish to publish in paperback, there are a few providers, but from my experience, only Createspace and KDP offer a totally free service to publish in paperback form. If you publish with either, there will only be a charge if you wish to buy copies of your book. Their prices are very reasonable, though, at around $3.85 per copy, plus postage for a 250-page book. As mentioned earlier, both Amazon KDP and Draft2Digital also offer paperback publishing. Learning how to format the interior and cover for a paperback takes a little more work than what is required for an ebook of course. A good starting point is A Step-By-Step Guide to Formatting Your Book’s Interior. Book covers have special requirements depending on how you intend to publish. As paperback covers need to be of very high resolution and exacting dimensions, this is one part of the self-publishing process that I always believe is worth spending a little money on. The same applies to ebook covers. While they don’t need to be of the same high quality as paperback covers, ebook covers still require a great eye-catching design so they should never be homemade. Invest a little money with your choice of one of the many professional cover designers available for hire on the Internet. Read More: How Much Money Does It Cost To Publish A Book? Publishing your first book used to mean months or years of trying to find a literary agent and publishing houses willing to give you a chance at being a published author. Alternatively, it was not uncommon to spend a fortune with vanity presses. Today, however, the easiest and quickest way of getting your book published is to use free ebook and paperback self-publishing services. You know how to write, but you might need to learn how to self-publish. 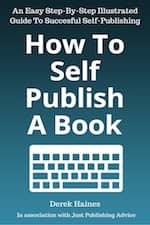 Just Publishing Advice gives new and not so new self-publishing authors all the help, tips and tricks, and how to guides you will need to help you get your book self-published and in front of millions of readers. Learn how to use Amazon KDP to get your books on Amazon and how to choose between Smashwords or Draft2Digital if you decide to use open publishing to access more retailers for your published books. Learn how to self-publish an ebook and promote and market it using keywords and metadata. Also, how to leverage social media to get your title in front of potential readers and help your book sales. For almost any question you have about self-publishing an ebook or book, you will probably find the answer on our site. There are over 500 self-publishing articles on our site covering topics including how to self-publish an ebook or a print on demand (POD) paperback, through to how to use advertising, promotion and blogging to increase sales. Other topics include ebook formatting, author promotion, marketing, using free ebooks and series starters to gain traction, as well as how to plan online promotion. Many authors choose to become independent publishers because self-publishing is now accepted as a mainstream part of publishing – because it sells books. Many indie authors have achieved great success by taking the decision to go it alone and become both authors and publishers. If you have a written a book and now want to move towards getting it published, there is nothing standing in your way to becoming a success story. All it takes is a little time to learn how to format your manuscript in Microsoft Word, and you will be ready to self-publish an ebook or paperback in a very short time. We post new articles regularly and also update our existing articles when trends or opportunities develop, so don’t forget to bookmark this page and come back for all our new self-publishing articles. Finding a self-publishing article on your topic of interest on our site is easy. Use the search box top of every page to find the precise information you are looking for or check one of our categories in the main menu. Click on Latest Articles in the main menu to read our most recent posts. If you are in a hurry or prefer to have all the necessary information you will need to get started at your fingertips, you may want to read our self-publishing guide ebook. How To Self-Publish A Book covers all the basics, step by step. In logical order, it takes the mystery out of self-publishing by giving you clear and often illustrated how-to guides for the necessary steps involved in successful self-publishing. Here are a few of the topics covered in the ebook. You can find How To Self Publish An Book on Amazon or on many other ebook retailers. There are thousands of indie authors who, like you, started with little or no knowledge about self-publishing, but who are now published, selling books and earning book royalties. All without having to pay a cent, or at least, very little, to do so. It is a very different path to finding a traditional publisher, but one that can be very rewarding. If you are prepared to take the time to read, learn how to market your book, ask questions on community forums and social media and subscribe to self-publishing advice blogs, you will have access to all the expertise you need to self-publish your book in a very short time. So good luck, and fingers crossed that once you are a published author you might have self-published a bestseller!